A tiny optical device built into a silicon chip has achieved the slowest light propagation on a chip to date, reducing the speed of light by a factor of 1,200 in a study reported in Nature Photonics (published online September 5 and in the November print issue). The ability to control light pulses on an integrated chip-based platform is a major step toward the realization of all-optical quantum communication networks, with potentially vast improvements in ultra-low-power performance. Holger Schmidt, professor of electrical engineering in the Baskin School of Engineering at the University of California, Santa Cruz, leads the team of researchers at UC Santa Cruz and Brigham Young University that developed the new device. "Slow light and other quantum coherence effects have been known for quite awhile, but in order to use them in practical applications we have to be able to implement them on a platform that can be mass-produced and will work at room temperature or higher, and that's what our chips accomplish," Schmidt said. Whereas optical fibers routinely transmit data at light speed, routing and data processing operations still require converting light signals to electronic signals. All-optical data processing will require compact, reliable devices that can slow, store, and process light pulses. "The simplest example of how slow light can be used is to provide a data buffer or tunable signal delay in an optical network, but we are looking beyond that with our integrated photonic chip," Schmidt said. The device relies on quantum interference effects in a rubidium vapor inside a hollow-core optical waveguide that is built into a silicon chip using standard manufacturing techniques. It builds on earlier work by Schmidt and his collaborators that enabled them to perform atomic spectroscopy on a chip (http://press.ucsc.edu/text.asp?pid=1356). The first author of the new paper is Bin Wu, a graduate student in electrical engineering at UCSC. The coauthors include John Hulbert, Evan Lunt, Katie Hurd, and Aaron Hawkins of Brigham Young University. Several different techniques have been used to slow light to a crawl and even bring it to a complete halt for a few hundredths of a millisecond. Previously, however, systems based on quantum interference required low temperatures or laboratory setups too elaborate for practical use. In 2008, researchers at NTT Laboratories in Japan developed a specially structured silicon chip that could slow light pulses by a factor of 170. 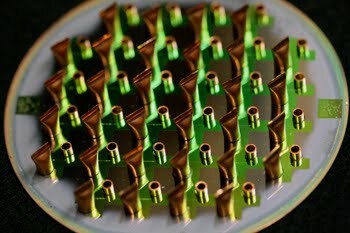 Called a photonic crystal waveguide, it has advantages for certain applications, but it does not produce the quantum effects of the atomic spectroscopy chip developed by Schmidt's group. Those quantum effects produce not only slow light but other interactions between light and matter that raise the possibility of radically new optical devices for quantum computing and quantum communication systems, according to Schmidt. In addition, the system makes it easy to turn the effect on and off and tune it to the desired speed of light. "By changing the power of a control laser, we can change the speed of light--just by turning the power control knob," he said. The control laser modifies the optical properties of the rubidium vapor in the hollow-core waveguide. Under the combined action of two laser fields (control and signal), electrons in the rubidium atoms are transferred into a coherent superposition of two quantum states. In the strange world of quantum physics, they exist in two different states at the same time. One result is an effect known as electromagnetically induced transparency, which is key to producing slow light. "Normally, the rubidium vapor absorbs the light from the signal laser, so nothing gets through. Then you turn on the control laser and boom, the material becomes transparent and the signal pulse not only makes it through, but it also moves significantly more slowly," Schmidt said. This study is the first demonstration of electromagnetically induced transparency and slow light on a fully self-contained atomic spectroscopy chip. "This has implications for looking at nonlinear optical effects beyond slow light," Schmidt said. "We can potentially use this to create all-optical switches, single-photon detectors, quantum memory devices, and other exciting possibilities."